New $10,000 Viral Contest Launch, Video Training & New YouTube Features! I sent you an email a couple of days ago about the new and improved Contest Burner tool & a new $10,000 contest. One of the prizes is to have my team and I build, market & consult you on a brand new site! You can also now download ContestBurner lite and try it out without signing up for anything. Just go to: Download Contest Burner Viral Marketing WordPress Plugin Download it and follow the instruction videos to install it on your WordPress based site. The other way to earn bonus points is by commenting on the Comment Burner blog. Feel free to comment & earn yourself some points right here… right now! Not only is this a contest but it’s a lesson in marketing. I love the plugin and I would love a new site from Bill’s amazing dream team. Okay, I’m hooked. Check out my new website… The Latest Contest! If you would like your contest featured here drop me a line at contestmanic@thelatestcontest.com. I’m asking the same question as Bob asked above, I would love an affiliate program. I have people asking me from all over the world about contest burner because of my blogs and articles. Loving the lessons in Marketing on the internet……amazing and it was all FREE!!!! Even Michael Jordan had a COACH! lots and lots of marketing lessons! How abot a dev version for us hard working developers? this whole idea sure is very cool. I just need to learn how to integrate it into my new website! coming down to the end of the contest!! I wastched you last week live and last night I missed your training. I am sure Interested in learning more. 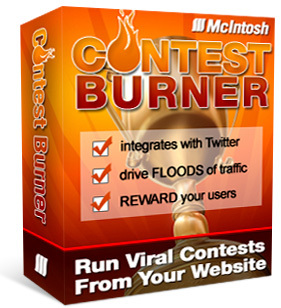 ContestBurner is a great way to grow a list FAST! Looking forward to trying out the Premium version.